With King Richard off fighting in the Crusades, his wicked brother Prince John tries to seize control of the throne for himself. While he is in power, he oppresses Saxon peasants in favor of Norman nobles. Meanwhile, a Saxon noble named Robin of Loxley becomes an outlaw to fight for the oppressed. 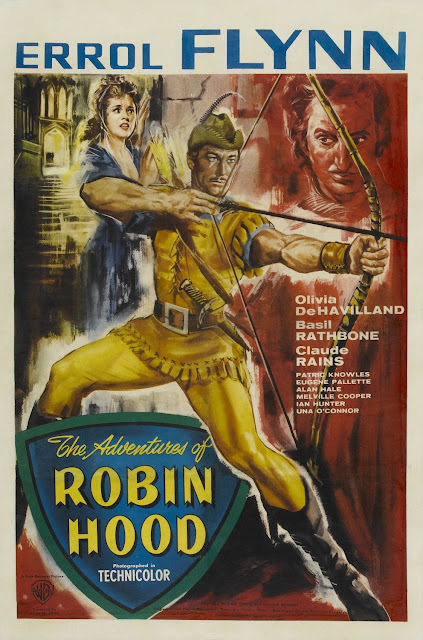 Very few characters capture the idea of a swashbuckling hero quite like Robin Hood. He has that certain bravado about him and has a flair for challenging the ruling class. This character has been brought to the silver screen numerous times throughout history, but no other portrayal is as memorable as the one found in the Oscar-nominated 1938 classic "The Adventures of Robin Hood." This movie is directed by Michael Curtiz and William Keighly. It stars Errol Flynn as the titular Robin Hood, a Saxon nobleman-turned-outlaw after he rallies against Prince John's oppression of Saxon peasants and his usurpation of his brother Richard from the throne. Joining Flynn is Claude Rains as the aforementioned Prince John, Basil Rathbone as John's right-hand man Sir Guy of Gisborne, and Olivia de Havilland as Lady Marion Fitzwalter, the eventual love interest for the story's hero. This is a classic Hollywood adventure story. It deals with themes that appealed to a widescale 1930's American audience including gallantry, chivalry, and the fight against tyranny. It is a big and colorful film full of lots of action and plenty of laughs, especially for the characters themselves. Hardly a scene goes by where Robin Hood and his merry band of men aren't belting out large guffaws. Errol Flynn has the proper look, swagger, and charisma to play such a roguish outlaw, and Claude Rains and Basil Rathbone do splendid jobs as his wicked adversaries. Olivia de Havilland fits the role of Maid Marion very well. She delivers a solid performance as the conflicted Norman who grows to respect and then love a Saxon outlaw. This film likely doesn't carry quite the same impact now that it did when it was first released. There are a few very noticeable and atrocious cuts in its editing. There are a couple of moments that feel far goofier than they likely did when this picture came out in 1938. The entire cast is dressed in bright green tights, and with multiple parodies coming out in the decades that followed poking fun of this fact, looking back at it now, the costuming looks ridiculous rather than era-specific. We look back on these errors now and marvel at how far Hollywood has come. We can be a little forgiving of these problems because of the period in which the film was made. Despite these flaws, "The Adventures of Robin Hood" is still a fun, dashing, vibrant, quotable movie that is enjoyable to watch even now, 80 years later.